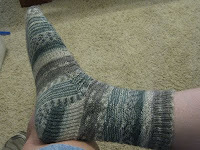 This is the sock that Beth knit. 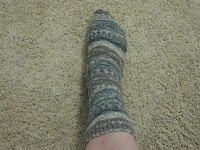 This is a foot, cozy and warm, wearing the sock that Beth knit. 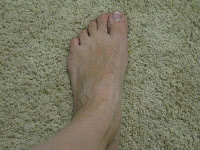 This is a foot, sad and forlorn, out in the cold and suffering scorn, for it has no sock that Beth knit. 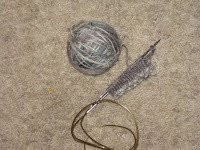 This is the yarn, ready to go, wishing to cover the other toes, and match the sock that Beth knit. Very cool sock! How long did it take to make the one? That was really cute! :) I'm in the middle, or at the beginning, of a sweater for DH. I really want to make some socks though.